Alesis Forge Review - Everything You Need Straight Out Of The Box? 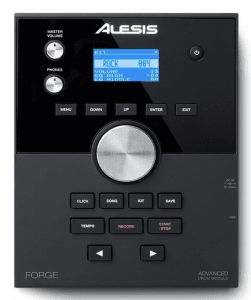 Alesis Forge Review – Everything You Need Straight Out Of The Box? 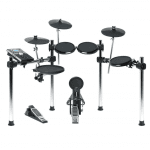 When you’re looking for electronic drums, there are a lot of kits to choose from. Their prices and quality are highly variable. No kit is perfect, and no kit will satisfy every drummer, but some kits have such great overall values that they can be hard to pass up. The ideal starter electronic kit is designed for the beginner, priced low, but still packed with enough features to make it appeal to just about everyone. Alesis has tried to make one of those kits: the Forge. But have they achieved that goal? This Alesis Forge review aims to answer that question. This is one of those purchases that includes everything you need to get started, which is great for beginners. It made me quite happy! This module is deep and rich, with great sounding samples and a pretty large library. It includes 70 distinct kits, 50 of which are factory presets and 20 kits you can custom-build. And the sound library contains 600 sounds, each carefully constructed. Also included in the Advanced Drum Module are 60 play-along tracks, which will help you practice (they help me! ), and a metronome (this is a drummer’s best friend, whether you are a beginner or a seasoned pro). Let’s be honest about rubber pads. Most of us don’t love them, and they are what keep a lot of people away from electronic kits in general. But not all rubber is the same, and not all rubber pads are created equal. So how are these pads? How do they stand up to higher-end mesh heads, or even to real life drum heads? These pads are great. Yes, they are rubber, but they are as responsive and lively as I can imagine rubber to be. Their response is, to put it in a word, natural. One of the great features of this kit is the way that the sample library is designed. In addition to the hundreds of samples that come pre-loaded, you can expand your library by adding custom.WAV format samples. Just insert a USB memory stick into the included input. This opens up a huge world of sonic possibilities. This is a great kit for its price, but if you’re thinking about buying it you may want to know a little more about what makes it good and also how it might fall short of your expectations. Sound library: the library of sounds on this thing is great. It is rather vast to begin with, and when you add in the ability to load your own samples, you end up with something that could never get boring. Price: There isn’t much to say about the price of this kit other than that it is quite good, given all of the things you get. This kit’s price makes it a great piece for beginners. Sound Quality: Don’t get me wrong, this kit sounds great (for its price), but there is still something left to be desired here. Higher-end electronic kits just sound a little better. Feel: Again, and for the price, the Forge feels great. There are, however, better-feeling kits out there. In the end, these are still the rubber pads that many of us don’t care for. Both the Forge and the Alesis Command come with the same module and thus boast the advantages you’ve read about above. But the Command comes with a higher price tag, and there is a reason for that: the pads are mesh rather than rubber, and this makes them more responsive and feel more like you were playing an acoustic kit. In general, these are both great kits, but the Command is on the higher end. The Nitro is the Forge’s somewhat smaller and, more importantly, cheaper cousin. It is the beginner kit in this line of Alesis kits. Both the Forge and the Nitro are tailored to beginners, but both still feature professional-level samples and great modules. In the case of the less expensive Nitro, there are fewer sound options (385) and fewer kits to store them in (30). In my view, the Nitro’s sounds are more than enough for any beginner. But you might have different needs here. So it’s really up to you. The TD1K is Roland’s introductory model. 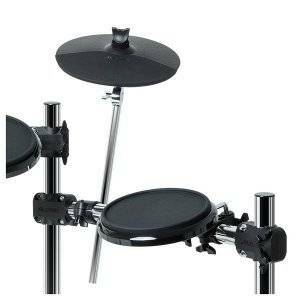 Roland is probably the best-known manufacturer for electronic drums, so you know that the quality is there. I find that the Roland has impressive sounds but there are fewer to choose from and “only” 15 kits to store those sounds in. It is a great kit, and might be higher quality, but in my view the limited selection of sounds is the issue here. In addition, the TD1K’s pads are very small, and for some people this is a problem. For me, this is another way in which the Forge delivers big despite its low price. Generally, you get more for your money with the Forge, but the Roland comes with the name and a high standard of quality. I think that the Alesis Forge is a great overall beginner’s kit. If you are new to drums, or if you are new to electronic kits, then this is a great buy. It has more to offer than the Nitro and will give you more bang (and thump, and crash!) for your buck than any other model in its class. The Alesis Forge won’t let you down! Neither in the rehearsal room nor on stage. If you have any experiences with the Forge, let me know in the comment section below. Also feel free to leave any other feedback – questions, comments, concerns, critiques. Is there anyway you can give me an idea of the assembled footprint for the Forge? I am a bit tight on space but think I can get it to work. If you could give me the smallest footprint and than a normal footprint size that would be great. No where have I beed able to find the dimensions of the rack. The comfortable / normal footprint would be 5ft by 3ft and I guess you could save about 6-12 inches on either side depending on your size and setup preferences. Thanks Yannick, that does help a lot. Nice website also and great reviews. You really helped me make an informed decision. Nice work. Thank you, Steve. I really appreciate your feedback! I’ve read your review for the nitro kit as well and you’ve mentioned a bunch of times about its training module, I was wondering if forge has it too? It’s my first drum kit so it’ll be a great help if you’d guide me through the best one. Thanks for asking! Actually, the Forge doesn’t have training functionality – other than a click. This is probably because Alesis built the Forge as a kit for the intermediate / advanced drummer who wouldn’t need the rudimentary training functionality the Nitro provides. In place of this, the Forge is more suitable to controlling and modifying all nuances of your sound like shown in this video. Thank you. I really appreciate the help! Good luck with the website, I know I loved it I hope other people will too. Thanks, Ahana! I highly appreciate your kind words! I am about to purchase Alesis Forge for our small church building that can cater around 60-70 people. It’s really a close space, concrete with no windows. So acoustic drum is not really an option. Do you think forge do not sound too much of electronic that can cope with the worship service on full band? Thank you. Thanks for your question. I think the Forge is a good choice for even a small church as it comes with loads of options to customize your sound. I wouldn’t be able to say which settings in particular would make it sound best in your environment, but I the options are definitely there and you should be able to find the best setup for your church very quickly. Can you tell me if either the Forge or Command will let me use my iPhone so I can play along to my music? Also, in your opinion how much better/quieter is mesh vs rubber? Thanks for all your reviewing work…incredibly helpful! Mesh is not better per se – it’s different. In terms of noise I always ask people to compare hitting a (fairly tense) cushion with a stick (= mesh) vs. hitting the pages of an open (failry thick) book (= rubber). And the analogy also illustrates the difference in feel: rubber will be harder giving you more rebound – which helps you when starting out, but then again mesh is closer to the rebound of an acoustic drum kit (in case you ever want to swap…). Hello, I am in the market for my first drum kit, i play guitar but I am a complete beginner on drums. I will be taking 1 drum lesson a week with an acoustic set. I am interested in the Yamaha dtx450k and the new Alexis surge (all mesh forge with nitro module). I have read some reviews claiming some Alesis sets to be quiet small. I am 6ft and would hate to get a set that’s to small for me. Could you provide me some insight on how they compare sound wise, size and quality? Also think your reviews are the greatest. 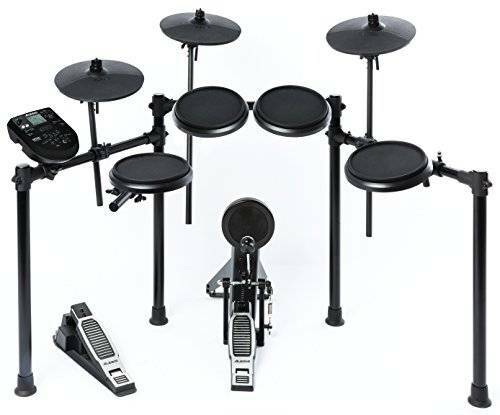 If you look at the picture of the Alesis Surge on the official product page, you see a standard setup of the kit with some room to up the toms and everything else by at least a few inches. In this case, the snare pad would situated at a height of approx. 2.5 ft, so there is room to bring it up to 3 ft I guess. I hope that helps you gauge things more precisely. I am still unsure of the size of these kits, being completely new to drums I m not familiar with snare pad measurements. Reading some other reviews that have stated the Alesis kits were smaller and more suitable for children. Do you have any insight on this? Is this kit suitable for a full grown adult? I understand your concern! Yet it 100% is suitable for adults. I’ve recommended it to dozens of my grown-up students and quite possibly 100s of readers via this site. And I haven’t had any complaints with regards to size. regarding Alesis drums. Please give me your opinion . Well, I think the Forge is a great kit, because of it’s professional look and setup, the sound quality and the very competitive price point. And of course you will have read about many more reasons why I like the kit in this article. Not specifically the FORGE but Alesis drums in general. Well, I don’t think that’s true either: the Nitro is a great kit and so are the Strike and the DM10X. Plus, I stand by what I’ve said about the Forge. I’m Looking into the Alesis Forge as not only my first electric kit, but also for recording an EP with a progressive rock trio. How would you say the kick pad would hold up with double kick pedals and do you believe the pads are sensitive enough to register ghost notes? Sounds like a great project! The Alesis Forge can easily accomodate any double bass pedal and will be able to register ghost notes too. In fact, this is in your own hands as you can easily modify the sensitivity of the kick pad – as well as the threshold for registering a hit. However, this triggered his desire to play and wants to expand the kit by adding a cymbal and other things. The internet reviews can be challenging as they are so diverse. Can you please give us some advice on adding to the kit? Thanks for your question. Finding the right pads to expand your kit can be a confusing endeavour indeed! So the Forge has 2 additional trigger inputs, 1 for a tom pad and 1 for a cymbal pad. As cymbal pad I’d recommend this. An alternative would be this Alesis pad, which wouldn’t do a better job and is more expensive. As tom pad, I’d recommend this one. Gostaria de saber se a alesis forge tem amplificador embutido. Ou será que pra eu ouvir o som dela vou precisar de um amplificador ou um fone ? Não, o Alesis Forge não tem um alto-falante embutido. Você precisaria de um amplificador ou fones de ouvido – exatamente como você disse. thank you very much for your articles and your reviews! They got me into finally buying my first ever drum set. 1- Which one is the loudest? Considering I live with my wife in a small apartment with picky neighbours, I don’t want to bother her too much! 2- I’ve read before that the Nitro has a rudimentary training module that can help the beginners: do you think that this is mandatory for a noob like me or there are other ways I can learn? I would like to get the Forge but I’m afraid that without the proper knowledge I would not use this kit to is full potential, but on the other hand I do not want to be held back by the Nitro lack of options. What would you do in my shoes? 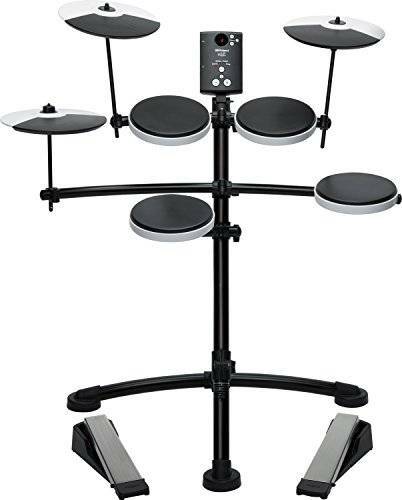 3- I started playing drums with the Guitar Hero World Tour Drum Kit, which I used so much that I needed to trash it after only 6 months of life. Do you think it would be possible to plug in the Nitro or the Forge and use them as a controller? Which are the difference connectivity options of these 2 sets? Thank you in advance for your help and keep up the good work. 2. The training functions in the Nitro are nice to have but not critical. In fact, for learning the drums properly I’d recommend a more structured platform and approach. I provide both here. Both the Nitro and the Forge have a MIDI output, so you can use both with Guitar Hero World Tour. Does it feature cymbal choke? Yes, the Alesis Forge has a chokable ride as well as crash cymbal. Hope that helps! Thanks for the review… I’m getting the forge 😬(who knew mesh pads on the command would push up the price so much 😏). Anyways, just wanted to ask. Do I need to buy specific headphones and a speaker or will my boss headphones and jbl boom box work fine connecting via an aux cable? Thanks for your question! Not knowing what kinds of Boss headphones you specifically have, I’m fairly certain they will do a fine job. As for the boom box I’m a little hesitant for it won’t be able to play all frequencies and volumes as well as a full-fledged amplifier. I recommend you test it and – if unsatisfactory – have a look at the link I gave you just now for alternatives. Sorry, that was suppose to say Bose headphones, not boss. I have the quiet comfort 35s. With regards to the speaker, i’ll test it out then. It’s a small room in my house I’m playing in so maybe it’s good enough. If you not I’ll look into an amp you recommend. Oh, well, Bose should work even better. And yes, test the box and see. Hello! Thank you for the review. I am saving money for my first drum kit and planning to buy this kit. I wanted to ask if there is any chance that I will feel disappointed? 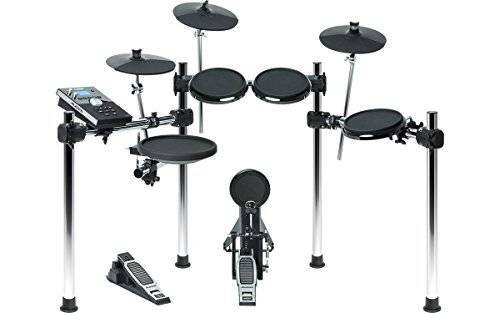 Like I should have saved more money to buy a better kit or do you think as a newbie I will feel great and comfortable with this drum kit? If you’re looking to use this kit for practicing, playing live or even some home recording – I’m very confident you won’t be disappointed. At least, that’s the feedback of most people who talk to me about the Alesis Forge. How many zones the cymbals have? Both crash cymbals of the Alesis Forge are dual zone and the ride has three zones (Bell, Bow, Edge).